Most books about Kung Fu or Karate deal with techniques or history. Few examine the underlying purpose of these arts, or approach them as a tool for spiritual, rather than physical, development. Barefoot Zen is a brave new approach to the martial arts, which clearly demonstrates that the traditional movements of both Kung Fu and Karate, contained in the solo choreographed sequences of movements known as forms (or kata), grew out of the spiritual practices of the Shaolin order of Buddhist monks and nuns. Nathan Johnson explains that this mystical and non-violent teaching is a profound and beautiful expression of Chan (Zen) Buddhism and its pur-suit of wisdom, peace, and enlightenment. Contrary to popular assumption, he contends that it was never intended to be an actual means of self-defense. 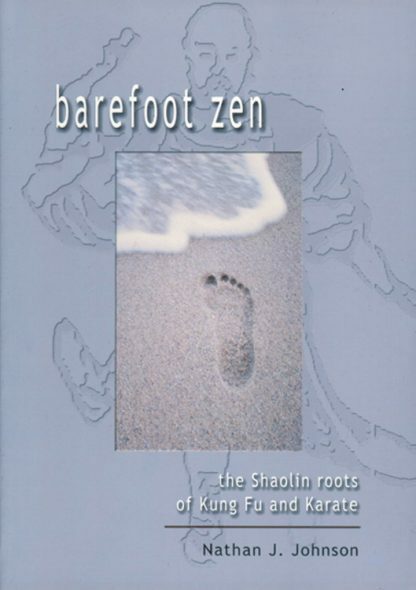 Barefoot Zen bridges the gap between Kung Fu and Karate, and reveals their common origin through the disclosure of vital research material on three of the world’s most important Karate kata. Part III explains the formation of many of the world’s Kung Fu styles. We learn that the original "empty hand art" was used as a method of kinetic meditation between pairs and was designed as a practical tool to assist practitioners in transcending the fear and insecurity of everyday living. Barefoot Zen makes the legacy of the Shaolin way accessible to all, releasing the art from the clutches of popular images and painful concerns about self-defense. The legendary courage of the Shaolin (Chan/Zen) order was not developed by fighting with enemies, but by not fighting! Nathan J. Johnson spent seven years learning Buddhism in a contemporary monastery. He holds a fifth degree black belt in Karate, a fourth degree black sash in Chinese Kung Fu and teaches Chinese empty hand arts and simple meditation techniques. He holds seminars and gives lectures throughout both Great Britain and the USA. His previous book, Zen Shaolin Karate has had several printings. He lives in Hampshire, England where he was born.